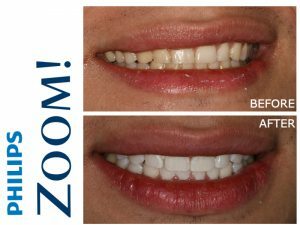 For stained or darkened teeth, often a professional clean followed by teeth whitening is the treatment of choice to brighten and enhance your natural smile. We love to see our patients and staff smiling, and nothing says confidence than a clean white smile! 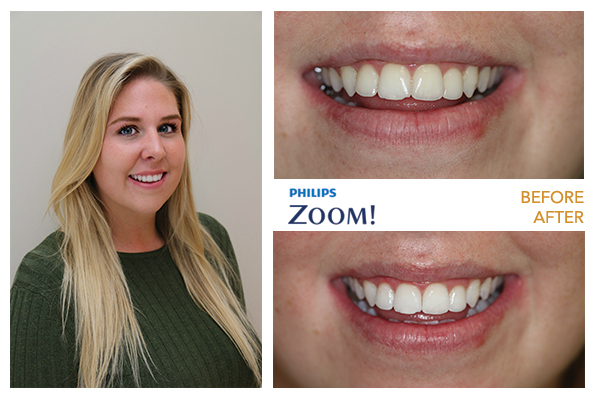 Our previous office manager Leanne recently decided to try out Phillips ZOOM! in-office whitening for herself. I was really happy with the ZOOM treatment and results. The procedure was very comfortable, I actually fell asleep! Afterwards I had a little sensitivity for a few hours. I have whitened my teeth in the past and wasn’t sure what to expect. I am so happy with my result. I would definitely recommend it! 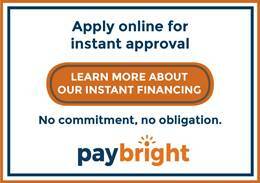 Call the Simcoe Dental Group on (647) 748-7787.